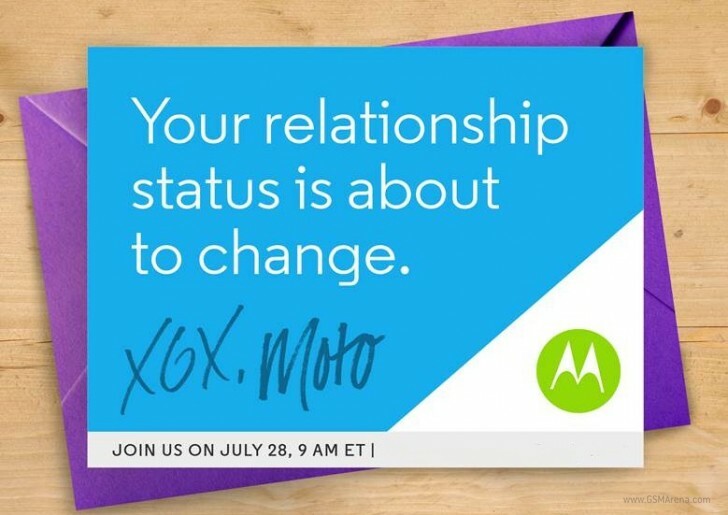 Today Motorola has sent out invites for a special event it will hold on July 28. A past rumor said the new Moto G will be announced on that same day. This is unlikely to be a coincidence. Alongside the Moto G (2015), other new handsets could be outed too. For example, the Moto X (2015), and maybe even the new Droid-branded flagship for Verizon. Something called Moto X Sport might see the light of day as well, since it was referenced in one carrier leak from last week. If you look at the image above, it seems that Motorola 'signed' it "XOX. Moto", but on closer inspection it may actually be "XGX" - in which case it's clear that we should expect two Moto X models and a Moto G.
This year's Moto G has been rumored to sport a 5-inch 720p touchscreen, a 13 MP rear camera, a 5 MP front-facing unit, Qualcomm's Snapdragon 410 SoC running the show (with a 1.4 GHz quad-core CPU), 1 or 2GB of RAM, 8 or 16GB of storage, and a 2,470 mAh battery. It should run Android 5.1 Lollipop from day one.